I Wrote A Book And It Has A Cover! That is something that still feels a little surreal, even as I am elbow-deep in revisions with my editor this week. The whole process has been amazing and exhilarating so far, and I am so excited to get it out into your hands in a couple months. Every pre-order will receive a copy of the audiobook version for free! Sign up here to be notified when pre-orders open! In January 2017, our family began a year of not shopping, in a minimalism experiment that we called the “More Than Enough Stuff Challenge.” I blogged and shared a lot about it here, and as the months went on during the year, I realized that I was learning such important lessons that I wanted to write them into a book to share with an even wider audience. In January 2018, I spent a weekend on a personal writing retreat in Joshua Tree, California to create an outline and start working on my manuscript. I essentially ate, slept, wrote, read and ran for three straight days, and when I finished the weekend I had a fairly comprehensive structure and some great ideas that needed to be fleshed out. I planned to work on the book all year and complete it by December. While I worked on it here and there, life and work took over and I spent far less time focused on the manuscript than I had planned. I thought about it a lot, but only worked on it a handful of times. When the year was coming to a close, I made a firm commitment to finish the entire first draft by the end of January 2019. The bones were all there, I just needed the meat. In January 2019, I wrote every single day. Sometimes twice a day. I focused and worked and eliminated my other distractions so that I could meet my goal. At the end of the month I went on another writing retreat weekend away. This time with a friend. I wrote for hours each day, and finished last chapter before hopping into my car and driving home. The last few months have been a whirlwind of hiring a designer and editor, and working on a launch plan and marketing team. The most recent incredible development is the final version of the book’s cover, which I approved last week and am so excited to share! So let me introduce you! I love the final cover so much. It feels just like what the book intends to teach, it’s approachable and warm while also being intentional and clear. There is so much about the process and my decisions surrounding the book to share at another time. Any questions you have, please leave in the comments so I can be sure to get to them. For now, I wanted to share this exciting development and the visual reflection of my pages of ideas. 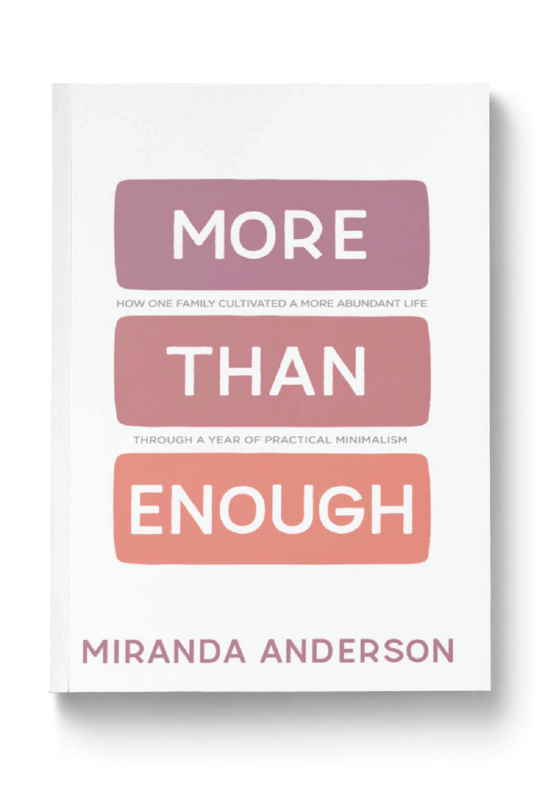 More Than Enough will be released in June, 2019, and you will receive the audiobook version (read by me) for free when you pre-order your copy of the book! Sign up to receive an email as soon as pre-order’s open RIGHT HERE, so you don’t miss out on this special offer! Thank you for all of your love and support through this process. I’ve loved sharing bits and pieces of it on Instagram, and will continue to update as things roll along. What a ride!